There are different hearing aid technologies and styles for different lifestyles. Whether you want to be able to enjoy the conversation at the dinner table, listen to music, or carry on a conversation while you are exercising, Integrity Hearing Services has a solution for you. Perfect for active people who encounter different types of background noise and more difficult listening situations. 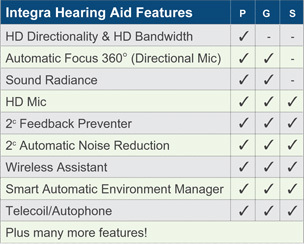 Our platinum hearing aids provide a variety of high-tech features. Maybe you would prefer manual control of certain hearing aid features. Our gold hearing aids are suitable if you occasionally face challenging listening situations. If you're involved in mostly one-on-one conversations and less challenging listening situations, our silver hearing aids can provide you with a reliable hearing solution at a friendly price point. What are are benefits of adding a hearing program to my ophthalmology practice? • Efficiency for patients to be treated in one place with doctors they trust. • Hearing will constitute a new revenue line that will play a role in filling the gap with decreasing reimbursements. • Your practice will be treating the same demographic for cataract surgery so you use Internal marketing and draw on your existing patient database. • Hearing can be a patient retention vehicle to bring back lost patients and re-engage them for other services. • Adding hearing has a low cost of market entry. Hearing loss is one of the most common long-term health problems facing older adults. According to a report by the Center for Hearing & Communication (2010), approximately 12% of the U.S. population or 38 million Americans have a significant hearing loss. About a third of people over the age of 65 have some type if hearing loss. Even 14% of people ages 45-64 have some type of hearing loss. Hearing loss happens for many reasons. Some people lose their hearing slowly as they age. This condition is known as presbycusis and can run in families. Another reason for hearing loss may be noise induced, like being exposed to loud machinery, music, construction equipment, etc. Hearing loss may also be caused by diseases (such as Tuberculosis, Lyme), or by viruses, childhood infections (Scarlet Fever), bacteria (Meningitis), or heart conditions, strokes, head injuries, tumors, or certain medicines knows as ototoxic drugs. For social consequences, studies have shown that people with hearing loss experience greater sadness, fear, anxiety, reduction of social activities, emotional stability, concentration problems, and depression. For physical consequences, if hearing loss is not corrected, it can result in physical issues such as: tiredness or fatigue, headaches, vertigo and stress. Do hearing aids restore hearing to normal? Hearing aids are aids to better hearing. They are not cures for hearing loss, but if you expect to hear better you will be pleased with hearing aids. What should I expect during a comprehensive hearing examination? In general, most hearing centers perform some variation of the standard air, bone, and speech testing. Integrity Hearing Services performs the most comprehensive exam available. Using state-of-the-art technology, we systematically perform a series of tests designed to predict the body's neurological and mechanical abilities to detect and amplify sound, as well as the ability to interpret speech. Testing is performed in a comfortable setting. A comprehensive test takes between 60-90 minutes.